La Salle senior basketball standout Julia Macabuhay was named the John R. Wooden CIF-SS Division III Player of the Year. The accolades keep on coming for La Salle High School senior Julia Macabuhay. 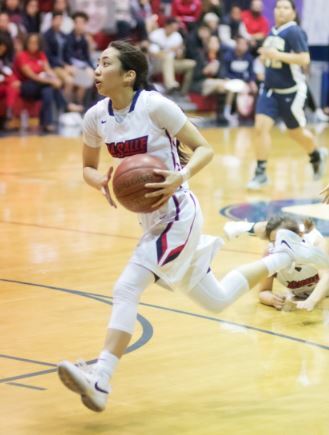 Weeks after being named the Santa Fe League’s top player and earning a spot on the All-CIF Southern Section Division 3A first team, the girls’ basketball star was given the John R. Wooden Award CIF-SS Division III Player of the Year award. Macabuhay received the award last Friday at the ESPN College Basketball Awards Show at The Novo. The senior guard led the Lancers to a Santa Fe League championship and the Division 3A quarterfinals, where La Salle’s postseason run ended with a 55-50 loss to No. 1-seeded Oxford Academy of Cypress. The UC San Diego-bound Lancer was one of the best players in the area, averaging 26 points, eight rebounds, seven assists and four steals per game.